This facet aims at making a man complete in all respects. This is the practical side of the religion. Its first portion is purifying and spiritual and second is moral. What is meant by morality? The morality is three-fold like the knowledge itself, the first kind of knowledge defines a thing what actually it is. The second kind explains what a thing ought to be. The third kind of knowledge deals with the methods, which make an ordinary thing an ideal one. For example, a person invented a radio set. At first it was observed as to what actually it was? This is the first type of knowledge when it was felt that it needed further improvements, it is second type of knowledge. What methods should be adopted to make it an ideal radio set? This is the third branch of knowledge. Similarly, ethics has also three aspects. There are many stages between the basest man and God Almighty. A man, however pious he may be cannot become God. He will be at a certain stage of piety. This stage can be a milestone of his journey towards the ultimate reality. Inspite of men's effort to achieve complete goodness, he cannot be devoid of some iota of evil. Thus, it can be concluded that man is bad. This is the first stage of morality that man should become aware of his shortcomings. The next stage will be as to what he should be? The prophets were the ideals set before various societies to which they were sent. And men is required to conform to the prophets in his character. He should try to follow them. This is the second stage. Third stage is to search out the style of life led by prophets. The practical adoption of this style is the actual demand so that a man might become an ideal man. Morality has two further branches. What we term as rational ethics is actually a part of divine revelations. The number of reformers is so large and their teachings are so vitally spread, though anonymously that a man can perceive higher moral values with the help of reason without believing in God. Even the man of Stone Age possessed reason but he could not receive higher moral values. This became possible after centuries. The concept of 'good' and 'bad' is so distinct that a man can recognise the same without knowing those who presented it. He knows that justice is good and injustice is bad. Truth is good and falsehood is bad. In this way, the rational ethics is available in a codified form. In the early period of mankind, rational ethics was also a portion of mandatory ethics. The prophets had circulated the same in the shape of commandments, such as the ten commandments of Moses. Later on, with the development of human reason even the non-believers are also practising the same commandments to the utter disregard of reward or punishment in the next world. Inspite of all the rational development the human mind is not free from error. It fails to recognize good or evil in some cases. Therefore, he takes benefit by obeying the mandatory provision of the religion and becoms safe from any loss. The major portion of mandatory ethics is common in all the religions. A small portion carries differences. It is this portion which has been exploited by the religious monopolists. The mandatory ethics is divided into two portions viz. "good" and "evil". It is here that some monopolists have tried to present good as evil and evil as good simply to make themselves distinguished. Some others have simply changed the procedure in some cases. For example, the concept of "fast" exists in all the religions but the actual practise slightly differs from religion to religion without diminishing anything from its moral importance. If we go deep in rational and mandatory ethics, we find that they are based on the following two factors. (i) Evil is based on usurping the rights of others. (ii) Good is based on giving everyone his due. It means 85% of good and evil is founded on the said two factors. For example, all the believers and non believers concede that murder, dacoity, theft, bribery and misappropriation are evils and are a clear injury of the rights of others. Therefore, these are evils. If we attentively look at adultery, we find that this too is an injury of others' rights. The woman on whom the adultery is committed is someone's daughter, sister, wife or daughter in law. By adultery the rights of all of them are injured. I cannot go into the details of all the crimes because I may miss my goal and my reader become perplexed. 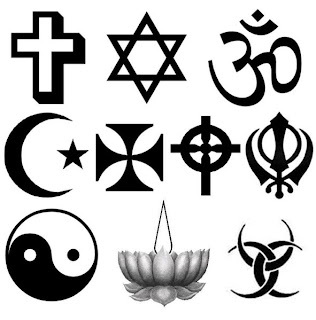 In the continuity of my article "Unanimity of Religions", I have added up some thoughts here and I want to share those with you all. A simple answer to this question is A requitable way." There are things, which are forbidden or allowed by the reason and there are others, which have been forbidden or allowed by God's order. So good and evil are of two kinds. One kind is specified by human reason and the other is defined by the prophets in the light of divine revelations. The following diagram will further elaborate the preceding thesis. Islam enjoins no coercion in matters of religion.